In researching tools for the 19th century I came across two websites that I found very helpful. The first is the Dalziel Barn, a Pennsylvania style barn in Ontario, Canada. Their website is chock full of interesting data on life for early and mid 19th century farms, architecture, tools and life. 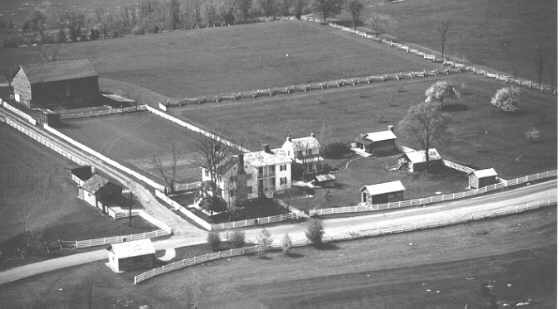 The second is Bushong Farm, a 19th century farm near New Market, VA that figured prominently in the Battle of New Market. The farm is now a museum. 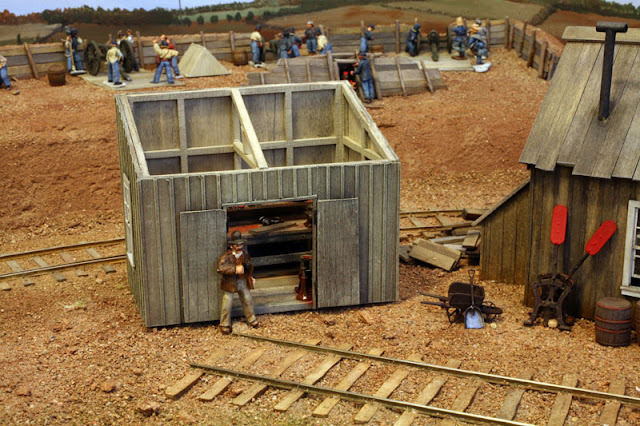 It would be a perfect prototype farm for ACW model railroaders to simulate. Many years ago I visited this farm and then built a 1/250 scale model of the main farm house for use in 10mm (1:160) scale war gaming. I tended to selectively compress my war gaming model structures by making them in a smaller scale than the figure scale. This was due to the ground scale being much smaller, typically 1:900, than the figure scale, which was 1:160. If the farm house was built to 1:160 scale it would be about the size of a foot ball field on the gaming table. I had always wanted to try some figure wargaming where the ground scale was the same as the figure scale. Once I did build a small european town in 1:700 scale and scratchbuilt some 1:700 scale armor vehicles to try some WWII gaming, but never did complete the project. I still have the kits from this and may go back to it a some point. I will be giving my talk on Introduction to Modeling the Railroads of the Civil War at the NMRA Potomac Division Minicon on April 2, 2011 at the St Matthews Church in Annandale, VA. They have an interesting slate of speakers lined up including special guest Model Railroader Editor Andy Sperandeo. I don't believe you have to be a member of the NMRA to attend the Minicon, but there is a $10 registration fee and you may have to join the Potomac Division for a small fee. My talk has been updated with some new graphics and photos including some finished scenes from my layout. If you are a blog reader, please stop by to say hello. ...See ya next week. In the meantime check out the 12 hour American LeMans Race at Sebring this Saturday. I had some time this weekend to do some interior decorating, on my layout that is. It is a rite of passage for an O Scale modeler to detail a tool shed. So after lighting the appropriate candles and incense, I took my crack at the ritual. 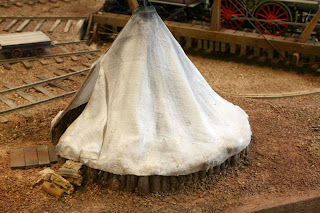 I also added a stockaded Sibley tent to the Falmouth turntable area. In both cases I added details to the interiors as these structures will be close to the layout edge and interior detail can be seen. A stockaded tent is one where the occupants add a log wall built like a miniature stockade to increase the tent head room. I used twigs to make the stockade. 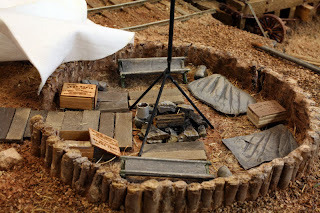 I added some cots, blankets on ground with straw underneath, hard tack boxes, some personal clothing in rolls and a small fire. As a visitor, if you crane your neck you can see into the tent. I struggled with finding a good place to put the tool shed as the engine terminal at Falmouth is running out of space. I want a spot where the viewer can look into the shed and see the interior details. The spot in this photo is probably where it will end up. Some of the other details I am adding at Falmouth are visible in this shot. 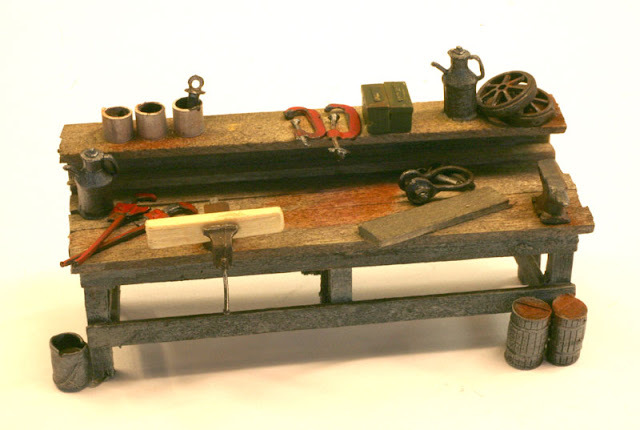 The workbench is removable for access and photos. Other than the telegraph lines the Clairborne Creek scene is done. 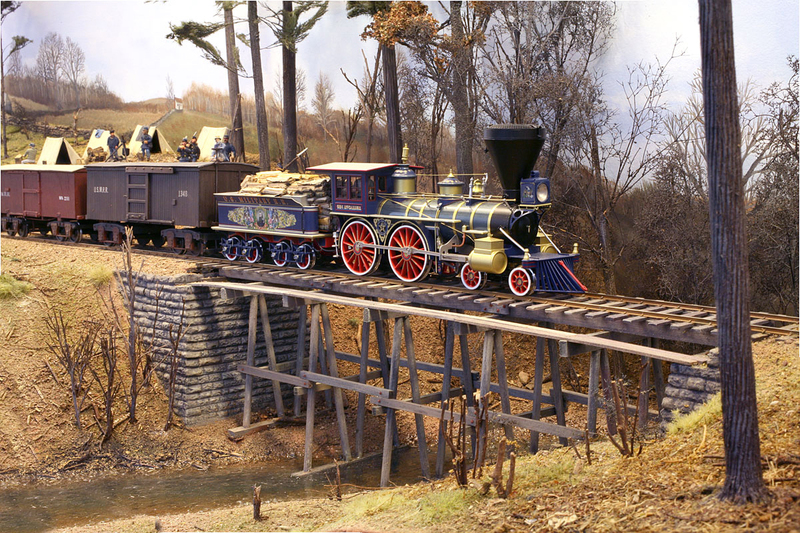 Here the McCallum heads south across the trestle. I completed the section of scenery behind the engine terminal at Falmouth. The effect I was hoping to achieve is an area picked cleaned of edible, burnable or generally useful materials as if a "swarm of locusts" have arrived to quote Gerry Fitzgerald. This shot is a panorama of two iPhone snaps showing the scenery around the curve. This is track is actually curved but the photo merge software straightened it out. The camp scene in the background is more of Brian Kammerer's artwork pasted on my sky boards. I like how the colors in the artwork, scenery and painted backdrops all blend together. This is something that would be very difficult to do with computer printed backdrops. For the grassy spots I used a Heki product that I spray painted with brown and olive to dull the colors a tad. Lots of ground leaves, small branches and dirt make the deforested look. The Falmouth water tank is just visible to the left. I know from train orders that there was a wood rick and water tank at Falmouth. I do not know what track arrangement was there. After the locusts departed, Norm and Daylene Wolf and their daughter, Ida (too shy for a photo), stopped by to visit the layout. Fortunately, they brought a batch of cookies to replenish the supply. Norm and Daylene checking out the bridge at Clairborne Creek. Gerry Fitzgerald and Doug Gurin stopped by for a mini-work session. We were also pleasantly surprised when Paul Dolkos stopped by to work too. 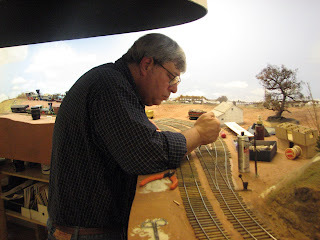 I am blessed to have such great model railroaders willing to help with the layout. Thank guys! Gerry and Doug continued to spike rail. There's only about 8,00 spikes to go. 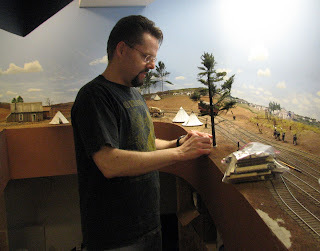 Paul started to lay the terrain surface between Accokeek and Potomac Creeks at the far end of the layout. He used heavy flooring paper hot glued to cardboard formers. This will get another layer of cardboard soaked in white glue to make a papier-mâché scenery base. This scene will an area with deep scenery and just a single track running through. The scenic treatmwnt will be woods and open fields, with army camps in the distance. The area where you see the water bottle in the photo will have some structures and tents. The red hill on the left will be the scene of a fortified blockhouse. It's almost time to paint some more backdrop in this area. the blockhouse was on the north side of the bridge. I didn't know that for sure when I laid out the scene. It was nice that I guessed correctly. I continued to add scenery to the Falmouth area including planting two trees, the oak and a pine. I added ground cover over much of the remaining area and installed a Sibley tent. I get some photos when the glue dries. Me adding roots to the lone pine tree with two part epoxy. As I get more experience in working in O scale I have begun to understand the differences in visual volume or impact between N and O scale. By that I mean that even simple scenes in O scale have the same visual impact as complex scenes in N or even HO. 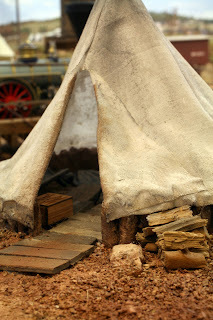 For example, take the picket camp scene. There three O scale figures arranged in a cluster have the same visual mass as a N Scale station or other medium sized structure. A full-sized 19 inch tall tree in O scale has nearly the equivalent visual impact in O Scale as a tall hill in N Scale. Thus, by planting this pine tree between the aisle and track, it serves as more than just a single tree would in smaller scales. It acts as a scene expanding view block, adds a compositional framing element, and is a neat model in its own right. Adding the tallest oak tree by the Falmouth freight house helps frame the abrupt end of the layout and helps establish the linear perspective. One trick I used in the Falmouth scene is utilize a two point perspective in both the backdrop painting and in the placement of the trees and other scenic elements. Note how the clouds to my left in the photo are smaller and more distant. Also note that the trees against the backdrop at the far end of the layout are smaller (about 10 inches). The new pine is about 13 inches. To the right (not visible in the photo) is a 19 inch tall oak on a slight rise. The overall effect creates a vanishing point that moves down the length of the layout making the room look bigger. Combined with the atmospheric perspective painted on the backdrop that recedes perpendicular to wall makes the small room look much bigger. Finally, I added some of the dried tea that Pete Magoun sent. He sent me four packages with different colors and textures. I am very impressed with this as a scenery material. The UK model railroaders have been using dried used tea for a long time. I will add it to my bag of scenery tricks. Thanks Pete. Not much work on the layout this week as I have been working on some other projects. I did make another pine tree and it might take the place of the white oak at Falmouth. I was listening to Prof Blight's lectures on the Civil War and he quoted this poem. 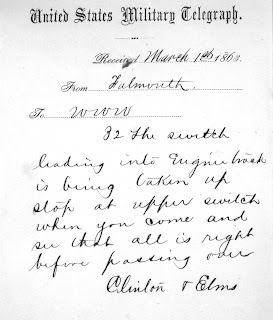 It is Herman Melville's reaction to the assassination of Lincoln. The emotion and power of this poem is palpable. I thought I'd share it. Panel Discussion: "Alexandria and the Civil War: Pride and Shame in Black and White." Alton Wallace, a good friend who is not a model RRer, but a historian of black history in Alexandria, and I attended a panel discussion last night where Ron Beavers was one of the speakers. 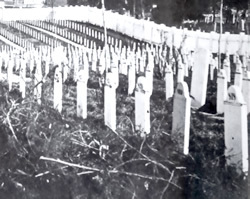 The discussion was entitled, "Alexandria and the Civil War: Pride and Shame in Black and White." 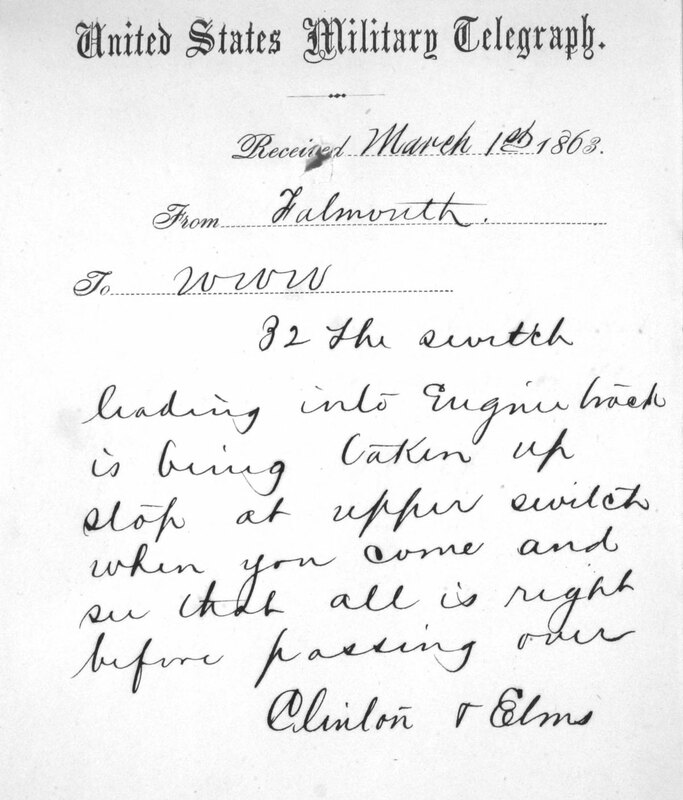 The advanced billing indicated that Ron would discuss railroading in Alexandria in the Civil War. However, his talk was more about the economic conditions in the city in the antebellum period. It was very good. ACWRRHS meeting at Alexandria. Last night he was dressed in a nineteeth century civilian banker's attire and looked dashing. With his hat on he could almost be mistaken for Robert E Lee. As I left the hotel, I noticed he was in the hall being swarmed by a group of at least 8 ladies. 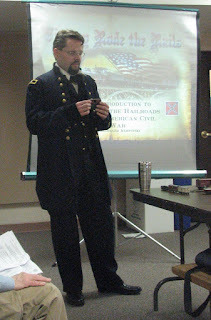 The other speakers focused on the experience of freed blacks and escaped slaves in Alexandria during the ACW and after. Two of the speakers were long time African American residents of Alexandria. Their insights in to growing up in Alexandria during the period of segregation was interesting and poignant. The first speaker gave a good summary of the history of the Contraband and Freedman Cemetery Memorial Park. She mentioned the role that many of these people played in the USMRR construction corps. This is an area I'd like to research more. It was an interesting night and though not all RR related, still well worth the time. By the way, Alton (Al) Wallace has written a book about the history of the Alfred Street Baptist church, called, "I Once Was Young." I found the chapters on the history of the church before and during the ACW fascinating. They are printing another 2,000 copies and you might be able to get a copy through the church.